By the time this is printed in newspapers, we’ll be remembering September 11th. Grateful for all the first responders and all who have served our Country to defend our freedom since that day. Grateful for the sacrifices their families have made as well. Thinking of and praying for the families of those who lost their lives in the attacks and in defense of our Country since. May we never forget! Encouragement: The wet weather has created challenges with harvest, making silage, increasing ear/stalk rots, kernel germination, and dampening spirits. So seeking to encourage: grateful for the soil moisture profile recharge the rain has provided and how it’s allowing pastures to recover and cover crops to grow! It’s really special to live in a State where our State Fair is now so ag and family focused! It was wonderful seeing so many farm families during the fair and I look forward to seeing many during Husker Harvest Days too! Thankfully harvest will be here soon and we’ll appreciate the sunshine that much more when we see it again! Sprouted Kernels: I’m seeing and hearing of kernel sprouting in hail damaged and drought stressed corn in addition to corn hybrids that have tighter husks and upright ears. Sprouting is also occurring in soybean. So why are we seeing this? Prior to full maturity it comes down to a hormonal imbalance within the kernels between gibberellin and abscisic acid (ABA). According to a study by White, et. al (2000), Gibberellin production with the lack of ABA allowed for kernel germination while less Gibberellin and more ABA deterred kernel germination. At full maturity, very little ABA is left in the kernel (in both corn and soybeans) which allows them to germinate in correct conditions after harvest. These conditions include temperatures above 50ºF and moisture. Thus the continuous drizzle and rain we’ve experienced can allow for sprouting within soybean pods. In corn, sprouting under those conditions typically occurs at the base of the ear first but we’re also seeing it in exposed ear tips. We’ve also seen Fusarium and Gibberella ear rot fungi occurring in ears that have been damaged by hail and/or insects in ears. These fungi also produce gibberellins which can aid in the hormonal imbalance and stimulate kernel germination. If you’re seeing kernel sprouting in your field, make sure your crop insurance adjuster is aware of the situation and submit samples for kernel damage due to mold and sprouting. Also check for mycotoxins prior to harvest if ear molds are a problem in your field. The local co-op will decide whether to accept the load based on percent damage and the standards they need to follow. If the load is rejected, contact your crop insurance agent to determine your next step. monitoring stored grain closely for hot spots, mold, and additional sprouting grain. 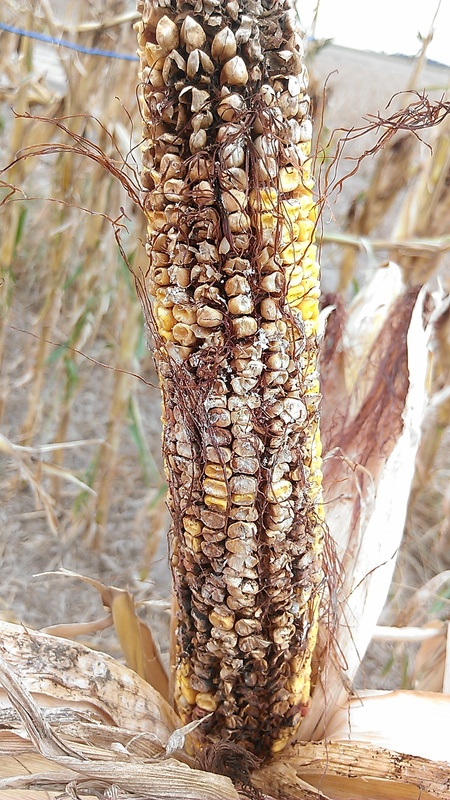 With the moisture continuing to exacerbate corn ear molds,particularly in hail damaged fields, you may also decide to take the grain for silage instead. More information regarding correctly making silage can be found at: https://cropwatch.unl.edu/2018/silage-hailed-corn. What is the nutrient value of the residue removed from the field? What are the impacts of residual removal on subsequent yields and field soil properties? What is the feed value of that residue? How do I best set my current equipment to bale corn residue? Is my current equipment the best to bale corn residue? This year, Nebraska Extension, Farm Progress, and several forage equipment manufacturers are partnering in a Corn Residue Baling Workshop at Husker Harvest Days (September 11-13). The workshop will be from 1:30-2:00 p.m. daily in the fields adjacent to the haying demonstrations, which begin at 2 p.m. Equipment manufacturers who have committed to the demonstration include: CNH, AGCO, Rowse Rakes, Vermeer, and John Deere. Some of the manufacturers will be showcasing the same equipment in this workshop and in the haying demos. Each manufacturer will talk briefly about their equipment and specific settings that might be needed to make their machinery work better on residue. Because of the high moisture content of the corn residue during the Husker Harvest Days Show, equipment demonstrations of baling residue are not a possibility; however, videos of the manufacturers’ equipment in action can be viewed in the University of Nebraska Institute of Ag and Natural Resources building. What do Mycotoxin Levels Mean? 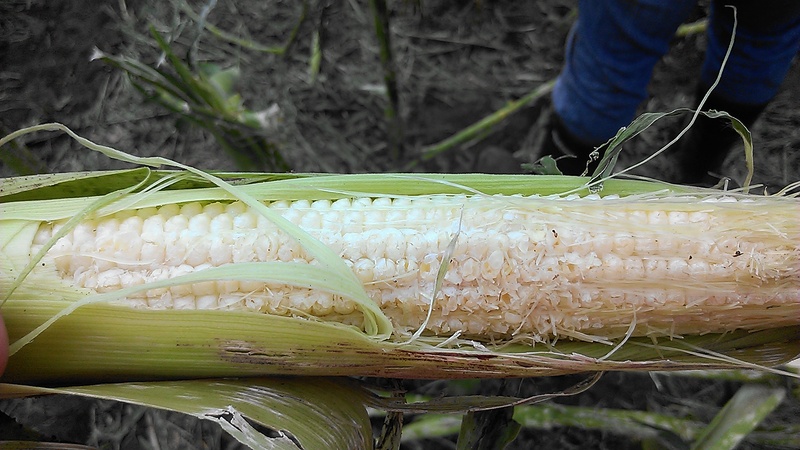 Last week I was receiving text messages from a few of our farmers about corn harvest results from damaged corn. Low levels of mycotoxins are being detected in samples thus far, thankfully. A reminder, the presence of mold does not automatically mean a mycotoxin is present. The fungi producing mold have the potential to produce mycotoxins. For aflatoxin, the U.S. Food and Drug Administration has set a recommended limit of 20ppb (parts per billion) for dairy animals, 100 ppb for breeding animals, and 300 ppb for finishing animals. To put this is simpler terms, a sample would need 20 affected kernels out of a billion kernels to be at the legal limit for dairy animals. So far, most samples are coming up at 5-6ppb which is very low. For fumonisin, 20ppm (parts per million) is the recommended limit set by FDA for swine, 30ppm for breeding animals, 60ppm for livestock for slaughter, and 100ppm for poultry for slaughter. So, this would mean 20 affected kernels in a million kernels could cause a problem for swine. Again, our levels are averaging closer to 5ppm right now which are low. Deoxynivalenol (DON) also known as vomitoxin is another mycotoxin being tested from grain samples. This mycotoxin causes reduced weight gain and suppresses animal feeding, especially in swine. Concentrations greater than 10ppm can result in livestock vomiting and totally refusing feed. FDA has recommended that total feed levels of DON not exceed 5 ppm for cattle and chicken, and 1 ppm for swine. It is very important to sample from several places in the grain to get an accurate sample for damage and mycotoxins. It is also very important that black light tests are not used to determine the presence or absence of mycotoxins. Some of these mold fungi produce a compound that fluoresces under black light, but research has shown that this quality does not consistently predict the presence of mycotoxins (often provides false positives). Finally, before any of your storm-damaged corn is put in a bin, call your insurance agent out to get a sample! There is some great information from the University of Nebraska Med Center on what types of masks to use to protect your health from molds and potential mycotoxins. Some people tend to have more sensitive immune and respiratory systems than others, so I’d highly recommend checking out these short videos. The rain was welcome on Thursday but the wind and hail damage that came were devastating to a good portion of the County. 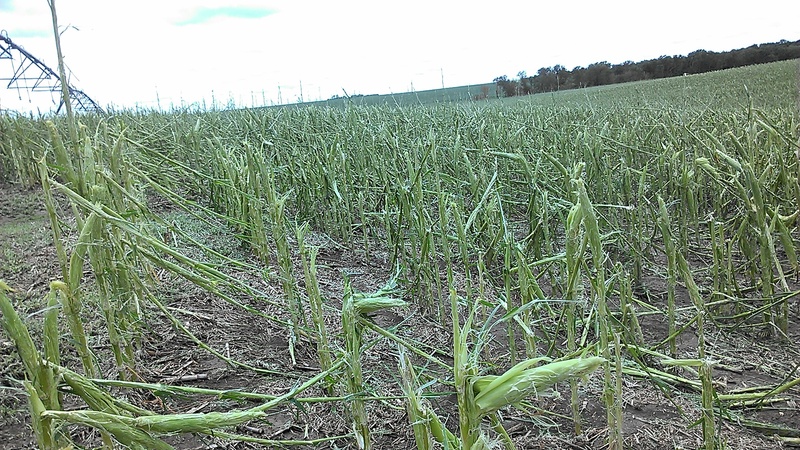 I’m so sorry to all of you affected….for some of you, this is two years in a row of severely hail damaged or totaled out crops. We are thankful the damage wasn’t worse. You can see more pictures here. So the big question is what do you do now? Ultimately, each field will need to be assessed on a case by case basis. The following are our NebGuides for hail damage to corn and soybeans. For the most part we were in brown-silk to blister for corn and late pod-beginning seed in soybean (R4-R5). The concerns I have right now are stalk quality, disease, grain filling, and the amount of diseased grain we may have due to mushy areas on hail-damaged cobs right now. Several years ago, we watched how severely hail-damaged corn a little later in the season turned brown and died. We also know that southern rust is in the area and while much of the leaf tissue in the County is damaged, it is still in the County in other fields and south of us. The Puccinia polysora fungus that causes southern rust, when severe enough, will infect and cause pustules on the stalks. With the wounding and low leaf area for photosynthesis, stalk strength is a concern and fungicides may be a consideration depending on potential yield loss-again need to assess on a field by field basis. I talked with a number of people on Friday regarding thoughts on silage, green chop, haying/baling, planting cover crops, etc. Dr. Bruce Anderson, UNL Extension Forage Specialist, said the most common salvage operation for corn damaged by hail, wind, drought, or other calamities is to chop it for silage. Don’t be in a hurry, though. Standing corn currently could be over 80 percent moisture. The easiest way, and maybe the best way, to lower moisture content is simply wait until some stalks start to turn brown. Waiting also allows surviving corn to continue to add tonnage. But in some of our damaged fields, I don’t think we can wait to make silage. Bruce also shared you can reduce moisture by windowing the crop and allow it to wilt one-half to one full day before chopping. You also could mix grain or chopped hay to freshly chopped corn to lower the moisture content. It takes quite a bit of material for mixing though – about 7 bushels of grain or 350 pounds of hay to lower each ton of silage down to 70 percent moisture from an original 80 percent moisture. That’s 7 bushels grain or 350 pounds of hay for each ton of silage. Or, you can allow that windrowed corn to dry completely and bale it as hay. Be sure to test it for nitrates before feeding. Grazing might be the easiest way to use damaged corn, and this is a good way to extend your grazing season. You might even plant some corn grain or sorghum-sudangrass or oats and turnips between rows to grow more forage for grazing if you can wait until late fall before grazing. Be sure to introduce livestock slowly to this new forage by feeding them before turning in to reduce the chances of digestive problems. Also, strip graze the field to reduce trampling losses and get more grazing from the corn. As I set here writing, we went from wearing t-shirts yesterday to receiving freezing rain and sleet today! The precipitation is much welcomed and it’s nice to see spring bulbs coming up and the grass turning green! But we’re unfortunately not out of the woods yet regarding this drought, and may not be for some time. 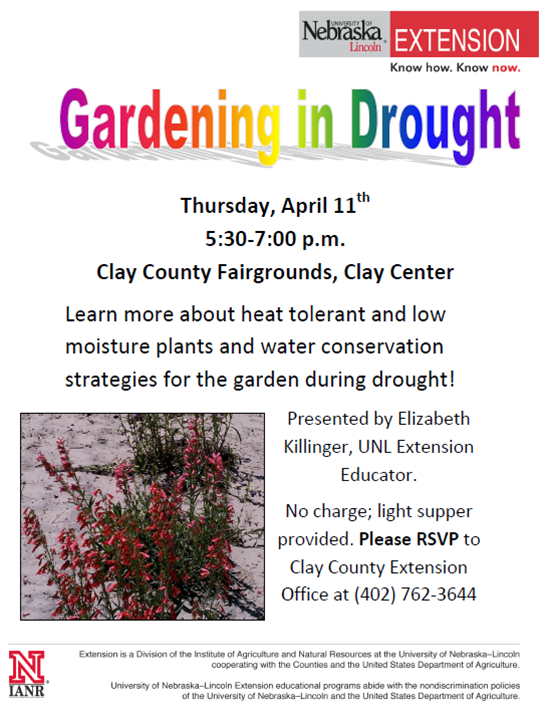 This Thursday, April 11, Elizabeth Killinger, UNL Extension Educator in Hall County, will be talking to us about gardening during drought. Come enjoy an evening of learning about drought-tolerant plants and ideas for your landscape! The evening begins with a light supper at 5:30 p.m. and we plan to be finished around 7:00 p.m. There will be no charge for this workshop, so please come and invite your friends and your youth who enjoy gardening as well! Also, if you would like to bring some plants for exchange, you are welcome to do so and share with others! Please call the Clay County Extension Office at (402) 762-3644 or Jenny at jrees2@unl.edu to let us know you’re coming so we can plan for the meal. See you then! 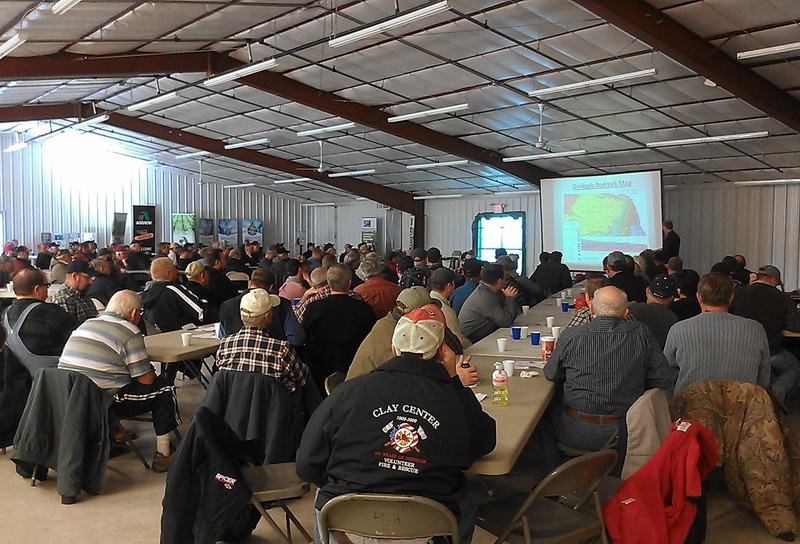 A few weeks ago, UNL Extension held our on-farm research meetings to share our 2012 Corn Planting Rate results for irrigated and dryland conditions. I always enjoy hearing our farmers share why they were interested in a certain trial and what they found out as a result. Our farmers followed protocols of 28K, 32K, 36K, 40K (40,000 seeds/acre) or 30K, 34K, 38K, 42K/acre for irrigated production and 18K, 22K, 26K, and 30K for dryland production. The results since 2010 continue to show us that each individual hybrid varies in its response to increasing populations; however, there is a general trend with newer hybrids that increasing population results in increased yields. Dr. Tom Hoegemeyer, UNL Agronomy Professor of Practice spoke about how our hybrids have genetically come so far in combating various stresses while maintaining yields. We know that many seed companies have conducted research to determine the population calibration curve for each hybrid to determine best recommendations for you. 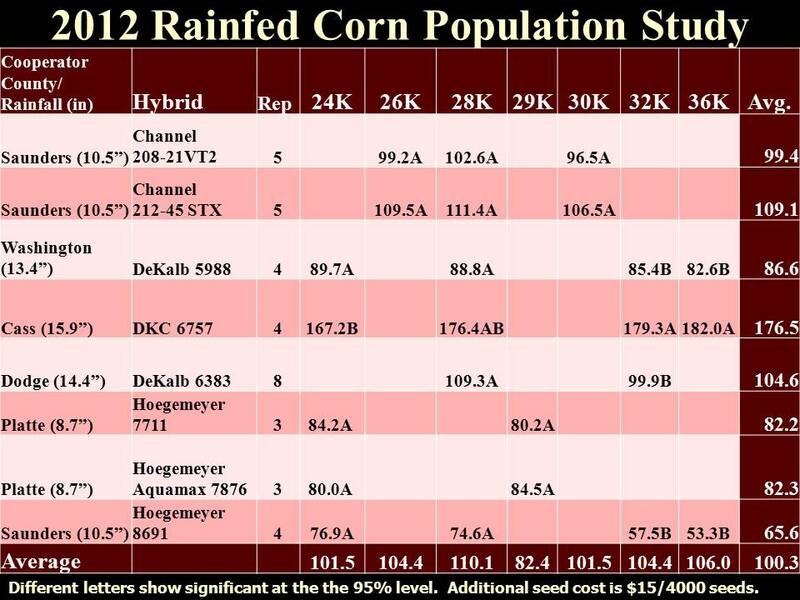 Thus, we’d recommend that you check with your seed dealer to determine which hybrid may fit best at which population for your operation. Even with this data, you may question if that’s truly the best population for your field; that’s where on-farm research comes in! We recommend testing the recommended population against a higher and lower population with at least 4000 seeds/acre difference in planted population-whether irrigated or dryland. With today’s technologies, it’s not very difficult to test seeding rates for different hybrids for yourself! So what rate should you plant this year? In the majority of our irrigated studies, economically, many hybrids maximized yields and economic returns between 32,000-36,0o0 seeds/acre. Again, this is very hybrid dependent so ask your seed dealer what he/she would recommend and test for yourself! Regarding limited irrigation, UNL research has actually shown a negative effect of lost yield by backing off population too far in a dry year. 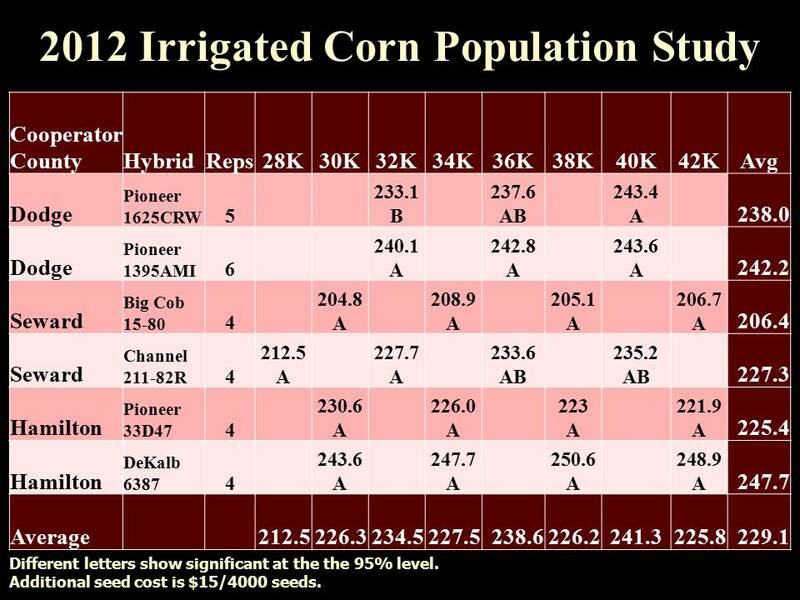 Tom’s recommendation was for dryland in Eastern Nebraska, most hybrids even with the low soil moisture profile should be ok with planting 24,000-28,000 seeds/acre. I realize we have essentially no moisture in our profile. But taking probabilities of rainfall events, March-May is usually pretty good and we don’t want to short-change ourselves in yield by planting too low of populations. For Central into Western, NE, I feel 20,000-22,000 seeds/acre will work for many hybrids. Our genetics have come so far since we finished the last drought in 2007 and were planting 18,000 seeds/acre in dryland. We will just keep praying for rain and hope for the best next year! Ultimately, test this and your other on-farm questions for yourself to know what will work for your farm! If you’re interested in conducting some seeding rate trials, please let anyone on our UNL On-Farm Research Team know! All our studies are posted on the CropWatch on-farm research page. What planting rates are you considering for 2013? We often say water is the lifeblood of agriculture. In a drought year like this, that truly is the case! 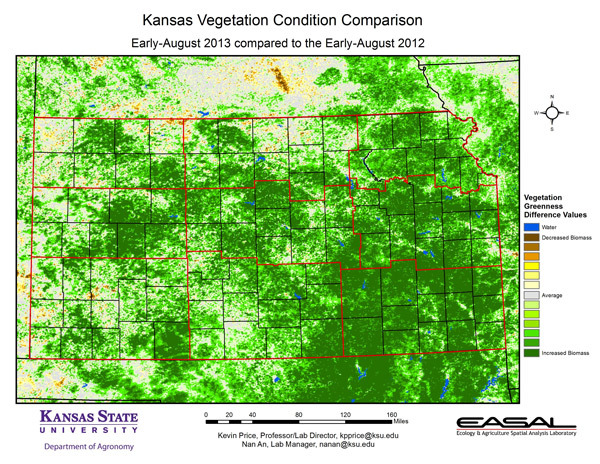 A case study showing the impacts of irrigated agriculture to Nebraska this year can be found here. Interesting is the dichotomy we’re experiencing in south central Nebraska where irrigated fields that were truly fully irrigated may have some of the best yields producers have experienced while in so many areas of the State-even neighbors a few miles away-are experiencing the worst year they have ever faced. Dryland yields have been all over the board mostly depending on tillage type. Irrigated yields that were truly fully irrigated have been outstanding. Hybrid Maize predictions for our area had been good all year for fully irrigated corn and it looks like they are even better than the long-term average predictions! Yet, as I drive around the countryside I can’t help but wonder at how many corn stalks are already being disked under. At a time when we’ve had several fires in our own State of Nebraska…when we have farmers and ranchers suffering trying to find forage for their livestock. We are so blessed to have irrigation here and that buffers our producers from weather extremes. But let’s not forget about the others who are hurting right now! I would ask our producers with irrigated fields to please consider leasing your stalks for grazing or baling them this year to help those in need of forage. Research from UNL shows that cattle and cornstalks go well together. Some producers worry about compaction but in a dry year like this, compaction is essentially a non-issue-at least this fall. 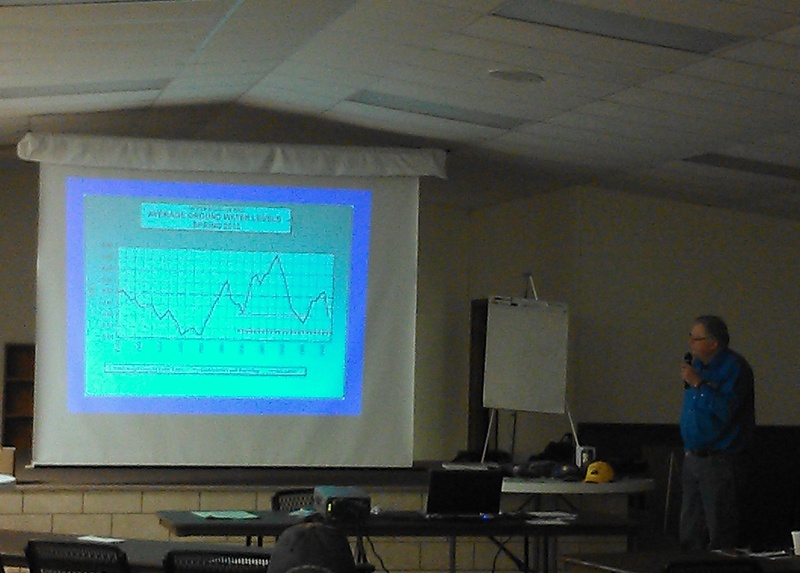 UNL research from 1996-2011 showed the effects of fall and spring-grazing on subsequent corn and soybean yields. On average, yield of the following soybean crop was increased by about 2 bu/ac with fall-winter grazing, and 1.3 bu/ac with spring grazing, compared with no grazing of corn stalks. Yield of corn as the second crop after grazing was not significantly affected resulting in an average of 1-3 bu/ac yield increase depending on fall or spring grazing. Check out this study and all our resources to help with drought decisions. An upcoming Webinar called Cornstalk Grazing-Understanding the Values to Cattle Producers and Corn Farmers scheduled for Oct. 2 from 12:30 to 1:10 p.m. will provide additional information. If you are unable to view it, it will be recorded with all our Beef Webinars. So while irrigation has provided life and good yields to many producers’ crops in the area, let’s not forget about our neighbors who are less fortunate. Please consider leasing your corn stalks or baling them to help others in need of forage for their livestock! You can connect with other producers by checking out the Hay and Forage Hotline at 800-422-6692. This hotline lists hay and forage including cornstalks that is available via sale or donation. 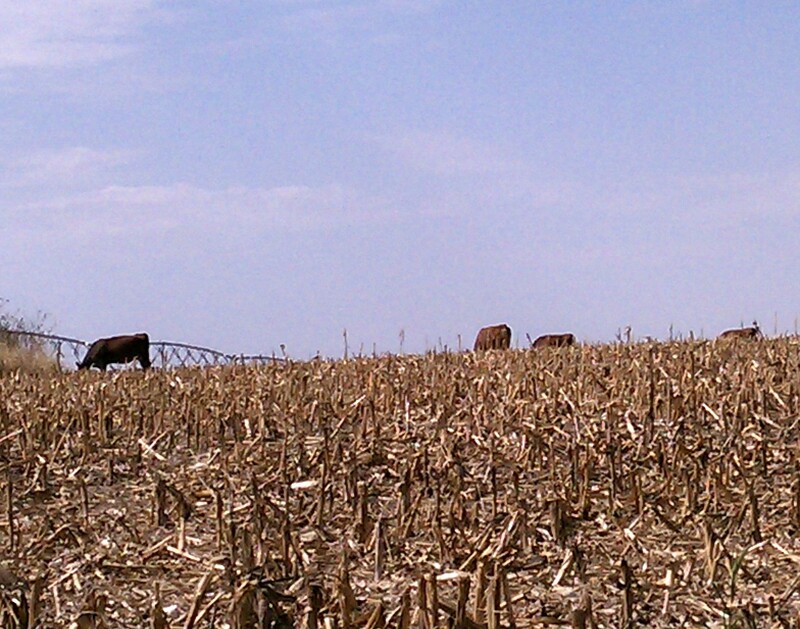 Additional Resource: How much to charge for cornstalk grazing?